Most of the first wave of amiibo for Super Smash Bros. 4, as seen at E3 2014.
amiibo (アミーボ, amiibo) are a line of interactive figurines available for usage with the Wii U, Nintendo 3DS, and Nintendo Switch systems. By scanning an amiibo with near field communication technology, players can receive various effects in games. For the Wii U, amiibo are scanned using the Wii U GamePad. The New Nintendo 3DS models are also natively compatible with amiibo, while older 3DS models require an NFC adapter to use the figurines. While the concept of figurines using NFC technology to interact with the Wii U was previously explored with Pokémon Rumble U, Super Smash Bros. 4 was the first game to feature the amiibo branding, acting as the debut and flagship title for the line. As of September 2016, Nintendo reports that 39 million amiibo figurines have been sold, along with 30.6 million amiibo cards. 4.2 Other series of amiibo compatible with Super Smash Bros. The early version of the amiibo menu screen, in Super Smash Bros. for Wii U, with Mario's stats being modified. Super Smash Bros. 4 supports the use of amiibo, with its series of figurines representing the various characters available for play in the games. All playable characters are represented. Some alternate costumes, such as male and female Corrin, have separate amiibo available. Others, such as Alph for Olimar, do not. 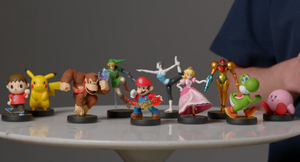 amiibo figurines are not required to unlock any characters or other features in the games, and they are completely optional for playing both versions. amiibo can also be used on any copy of the game (even if the character has not been unlocked or downloaded), and the character on the amiibo is tied to the figurine, allowing for players to use its customized moveset and fighting style wherever they desire. amiibo, when scanned by the console, allow the character represented by the figurines to be used in-game as a customized CPU opponent. Any amiibo figure corresponding to a Smash character may be used, not just the ones released in the Super Smash Bros. amiibo series listed below. The in-game character can be modified by players with character customization options. Unlike normal fighters, amiibo fighters' stats are modified by "feeding" them equipment, including equipment the character cannot normally use; for example, an amiibo Mario can be given Hammer equipment, which would normally be impossible. There is a limit to how many times the amiibo can be fed before battling, however, and any equipment that's given to an amiibo is permanently lost. An amiibo can also "learn" up to three bonus effects from the equipment they are given. By default, the amiibo's stat total is capped at 120. As with other player-designed custom sets for characters, amiibo can be assigned a name and a specific alternate costume as well. After this, they can be used as a specialized computer player, with the tag "FP" (Figure Player) above them. Figure Players start at level 1 like regular CPU players, but as they fight more often, they can continue to level up, to a cap of 50. As they gain levels, amiibo can potentially "learn" techniques from other characters: if a player frequently uses long-ranged, camping techniques, then the amiibo will also begin to emulate this behavior. This learning continues even after the 50 level cap is reached. In addition, an amiibo can gain improved fighting statistics, such as improved damage, knockback, and reaction times, the higher its level is. Finally, higher-leveled amiibo can adapt to individual matches faster than lower-leveled amiibo; if an opponent takes on an aggressive, rush-down style against an amiibo in one match, for instance, it will begin to make more use of defensive techniques like spot dodges and rolls. However, even high-level amiibo may have their flaws on complex stages, like walking back and forth before fighting on stages like Gaur Plain. amiibo also gain gold and other items while fighting, which are retrieved when checking them in the amiibo menu. Aside from gold, players may also receive custom parts or trophies. The longer the amiibo has fought, the more presents and gold are received. These items can be retrieved when the amiibo is scanned on its owner's console under the amiibo menu. While Super Smash Bros. for Wii U natively supports amiibo, Super Smash Bros. for Nintendo 3DS was unable to do so at launch. Version 1.0.5, released on February 9th, 2015, added support for scanning amiibo if the game is played on a New Nintendo 3DS or New Nintendo 2DS, while version 1.0.8, released on June 14th, 2015, added support for an external NFC reader/writer accessory, enabling support for earlier 3DS and 2DS models. The user must have one of these pieces of hardware to use amiibo with the 3DS version. Owing to their ability to be "trained" and used on other consoles, amiibo tournaments have become a minor side-event at some Smash 4 tournaments. The editor who added this tag elaborates: Add additional functions, like inherit from spirits. Possibly add a personality table. Amiibo compatibility returns in Super Smash Bros. Ultimate. All amiibo figures compatible with Super Smash Bros. 4 are compatible with Ultimate, as well as figures for newcomers and other veterans who were not playable in SSB4. amiibo data from SSB4 can be transferred to Ultimate, although high level FPs will level down to a set level (for example, a level 50 FP would level down to level 12). When transferred, the amiibo data will no longer work in SSB4. The player can also have the option to start from scratch. Figure Fighters can inherit Spirits and gain their effects but they will be permanently consumed. The amiibo will also gain the spirit type, and its status will always be active regardless of whether the player has spirits on or off in the rules. Each amiibo can inherit up to 3 of the support spirits' skills. There is also a new mechanic in which a personality trait is listed, and is usually changed after inheriting a spirit. It affects the Figure Fighter behaviour within battles, with the trait relating to the AI, such as Reckless causing the Figure Fighter to be more aggressive, or a Cautious personality causing the figure player to keep a distance from the opponent. Additionally, the ability for an amiibo to learn and gain experience during battle can now be enabled or disabled on the amiibo menu, essentially freezing the AI. Figure Players can also be used in the game's Training Mode in place of the CPU, though they do not gain experience. amiibo for characters from other series who are not playable in the game will grant an award, either coins, spirit points, or spirits based on the character used. However, only one reward will be granted per figure, thus making the amiibo unusable indefinitely. For Smash, amiibo are released in waves. Several staggered release dates have been announced, with each date containing a subset of the entire Smash lineup. The waves, the figurines they contain, and their release dates are detailed below; waves are listed in their North American sets and dates, although the contents of each wave sometimes vary by region. Smash-related amiibo are priced at $12.99 in the US, $15.99 in Canada, £10.99 GBP in the United Kingdom, $17.95 AUS in Australia, ¥1200 JPY in Japan, and €14.99 EUR in Europe. The first wave of amiibo launched on November 21st, 2014, alongside the North American release of Super Smash Bros. for Wii U. The European release followed on November 28th, 2014. In Japan this wave was released alongside Wave 2 on December 6th, 2014. The second wave of amiibo was released alongside the first one in Japan on December 6th, 2014. It was then released on December 14th, 2014 in North America and on December 19th, 2014 in Europe. Eight amiibo from the third wave were originally released in Japan on January 22nd, 2015, specifically Bowser, Sheik, Toon Link, King Dedede, Meta Knight, Ike, Lucario, and Rosalina & Luma. The final three amiibo, Sonic, Mega Man, and Shulk were released on February 19th, 2015. The entire wave was released in Australia on January 29th, 2015, and in North America on February 1st, 2015. In North America, several of the amiibo are exclusively available through specific retailers. In Europe, Wave 3 was split in two. Bowser, Ike, Lucario, Rosalina & Luma, Sheik, and Toon Link were released on January 23rd, 2015, while King Dedede, Mega Man, Meta Knight, Shulk, and Sonic were released on February 20th, 2015. The first six amiibo from the fourth wave were originally released in Europe on April 24th, 2015 and in Japan on April 29th, 2015. These are specifically Ness, Charizard, Wario, Robin, Lucina, Pac-Man. The final two amiibo, Jigglypuff, and Greninja were released in Japan on May 28th, 2015 and in Europe on May 29th, 2015. The entire wave was released in North America on May 29th, 2015. Like Wave 3, in North America, several of the amiibo are exclusively available through specific retailers. The Pac-Man amiibo was sold exclusively at Best Buy on October 19, 2018, in line with the upcoming release of Super Smash Bros. Ultimate. The fifth wave of amiibo was released in Europe on June 26th, 2015, in Japan on June 11th, 2015, and in North America in late July 2015, with Dark Pit releasing on July 31st, 2015, and Palutena releasing on July 24th, 2015. This wave also included Palutena as the first amiibo to be exclusive to an online retailer in North America, as well as being the only wave containing only exclusives in North America. The sixth wave of amiibo was released in North America on September 11th, 2015, in which the following amiibo were available: Zero Suit Samus, Olimar, Bowser Jr., Dr. Mario, and Ganondorf. In Europe and Japan, Ganondorf and Zero Suit Samus released alongside Wave 5, and Dr. Mario, Bowser Jr., and Olimar were released on July 17th, 2015, with the remainder of the wave releasing in September 2015. R.O.B., Mr. Game & Watch, and Duck Hunt were bundled together as a "retro 3-pack" in North America and released exclusively at GameStop on September 25th, 2015 in North America and were individually released on October 29th, 2015 in Japan. This was the final set of amiibo featuring starters. The Mr. Game & Watch amiibo features multiple, swappable poses. Mr. Game & Watch's multiple poses. The seventh wave of amiibo was released in Europe on October 23rd, 2015, in Japan on October 29th, 2015, and in North America on November 13th, 2015. This wave included the release of the first amiibo of a downloadable character, Mewtwo. Falco was released in North America exclusively at Best Buy and Europe on November 20th, 2015. The three Mii Fighters was released in the United States on November 1st, 2015 in a 3-pack exclusively at Toys "R" Us . The 3-pack was released in Canada on November 20th, 2015. The three Mii Fighter amiibo were released individually in Europe, on the same day as R.O.B., Mr. Game & Watch, and Duck Hunt were released. The Lucas amiibo was the only amiibo in the eighth wave, which was released in Japan on December 17th, 2015, in North America on January 22nd, 2016, and in Europe on January 29th, 2016. It is the only wave to not feature any newcomers. The ninth wave of amiibo was released on March 18th, 2016 in North America and Europe, and on April 28th, 2016 in Japan. This wave included the releases of the DLC fighters Roy and Ryu, with Roy being a GameStop exclusive in North America, and the first international release of R.O.B. with his Famicom color scheme. The tenth and final wave of Super Smash Bros. 4 amiibo released worldwide on July 21, 2017, and featured amiibo of the last three DLC characters: Bayonetta, Cloud, and Corrin. Each of the three received an alternate version based on their alternate costumes: Bayonetta's design from the first Bayonetta game, Cloud's Advent Children costume, and female Corrin. The alternate amiibo with these designs are officially referred to as "Player 2" versions. The "Player 2" versions of these three fighters were exclusively available through specific retailers. Wave 11 marks the first wave of characters from Super Smash Bros. Ultimate. It launched alongside the game on December 7th, 2018 and features two of the game's newcomers, Inkling and Ridley, as well as Wolf, a veteran returning from Brawl. Wave 13 marks the third wave of characters from Super Smash Bros. Ultimate. It was launched worldwide on April 12th, 2019 and includes returning veteran Young Link and newcomers Daisy and Ken. Wave 14 marks the fourth wave of characters from Super Smash Bros. Ultimate. It will launch on July 19th, 2019 in Japan and Europe, and on July 26th, 2019 in North America. This wave includes returning veterans Pokémon Trainer and Pichu, along with newcomer Isabelle. Over 710,000 amiibo from Wave 1 were sold prior to the introduction of Wave 2, with Nintendo also stating that sales were approximately equal to those of Super Smash Bros. for Wii U. amiibo of Link were said to be the most popular, with Mario and Pikachu being the second and third most popular, respectively. At the end of 2014, it was announced that amiibo had outsold Super Smash Bros. for Wii U by a factor of at least two to one, with over 2.6 million figurines being sold ; a later quarterly report from Nintendo claimed that over 5.7 million amiibo were shipped worldwide. Demand for some amiibo far exceeded supply, leading to supply shortages. Pre-orders for Rosalina & Luma broke sales records for Target, with the figurines selling out in only 35 minutes. amiibo from wave 4 caused such huge demand that the web servers for GameStop crashed when pre-orders became available. GameStop also sold out of pre-orders for all Wave 4 amiibo in less than five hours. Ace Combat: Assault Horizon Legacy Plus Unlocks skins for the player's fighter based on the scanned characters. amiibo tap: Nintendo's Greatest Bits Unlocks timed demos of various NES and SNES games. Animal Crossing: amiibo Festival Adds a golden statue of the Smash Villager to the plaza. Allows the player to use Isabelle within the game. Animal Crossing: Happy Home Designer Awards the player a golden statue of the Smash Villager. Allows the player to design a house for Isabelle. The house can be saved to the amiibo. Animal Crossing: New Leaf: Welcome amiibo update Invites characters with The Legend of Zelda themed appearances and items to the player's campground. Scanning Link or Zelda invites Wolf Link; scanning Sheik invites Epona; scanning Ganondorf invites Ganon; and scanning Toon Link invites Medli. Causes Wisp to visit the campground in his own RV, containing a golden statue of the Smash Villager and furniture based on Nintendo hardware. Causes Isabelle to visit the campground in her RV while Wisp fills her duties at Town Hall. Invites Inkwell to the campground in his RV, containing a Splattershot and furniture based on the Splatoon games. Bayonetta 2 (Nintendo Switch) Gives the player all the bonus costumes from the Super Mirror 2 from the start. Also obtainable through normal gameplay. Gives the player costumes from the original Super Mirror, as well as the Nintendo-themed costumes with Bayonetta's old hairstyle, minus the Fox costume. Also obtainable through normal gameplay. Unlocks a costume based on the scanned character, a unique message written by Rodin, and a couture bullet for each character, although scanning a Zero Suit Samus or Falco amiibo would still unlock the Samus and Fox costumes respectively. Also obtainable through normal gameplay by purchasing the costumes with halos like the Wii U version. Unlocks the Chain Chomp weapon early. Also obtainable through normal gameplay. Grants the player extra in-game currency, items, or materials. Bye-Bye BoxBoy! Unlocks character-based costumes for Qbby. Captain Toad: Treasure Tracker Gives the player 1-Up Mushrooms. Chibi-Robo! Zip Lash If the player has also linked a Chibi-Robo amiibo to the game, figures of Chibi-Robo imitating the scanned amiibo's pose will be added for collection in the Toy Capsule Machine. Gives the player 50 or 100 Moolah once a day. Also applies to the amiibo that unlock pose figures. Up to 20 amiibo can be scanned daily. Code Name: S.T.E.A.M. Makes the scanned character usable once per level, although they cannot be revived at checkpoints. Diablo III: Eternal Collection Summons a group of challenging enemies for the player to face. Fire Emblem Echoes: Shadows of Valentia Allows the player to summon an illusory version of the scanned character as an ally in battle. Summons an illusionary version of an enemy as an ally. Fire Emblem Fates Allows the player to challenge the scanned character to battle and recruit them into Corrin's forces. Fire Emblem Warriors Grants the player the exclusive Chrom's Training Sword that only Chrom can wield. Grants the player a sword of the highest level available. Grants the player a Tome of the highest level available. Grants the player a random weapon of the highest level available. Grants the player gold, materials, or weapons. Hey! Pikmin Summons additional Pikmin for Captain Olimar to use, and unlocks the amiibo as an in-game treasure that can be collected. Gives the player 10 Sparklium Seeds. Hyrule Warriors The first time scanning one of these amiibo unlocks the Spinner weapon class for Link. Gives the player a weapon for Link with at least three stars every time after the first. Gives the player a weapon for the scanned character with at least three stars. Gives the player a weapon with up to three stars, a random material, or a random number of rupees. Up to five can be scanned daily. Hyrule Warriors: Definitive Edition Gives the player a weapon for the scanned character with at least three stars. Kirby and the Rainbow Curse Unlocks infinite star dash for Kirby for one level per day. Unlocks a Meta Knight mask for Kirby and increases the speed of his tap dash for one level per day. Unlocks a King Dedede hat for Kirby and gives two additional health bars for one level per day. Kirby: Battle Royale Unlocks the Ultra Sword Hat for Sword Kirby. Unlocks the Galacta Knight Mask for Meta Knight. Unlocks the Masked Dedede Mask for King Dedede. Kirby: Planet Robobot Provides the Smash copy ability to Kirby. Colors Kirby green and gives him the Sword ability. Colors Kirby yellow and gives him the Hammer ability. Gives Kirby the Fire ability. Gives Kirby the Parasol ability. Gives Kirby the Stone ability. Gives Kirby the Doctor ability. Gives Kirby the Ice ability. Gives Kirby the Bomb ability. Gives Kirby the Whip ability. Gives Kirby the Fighter ability. Gives Kirby the Sword ability. Gives Kirby the Mirror ability. Gives Kirby the Ninja ability. Gives Kirby the Poison ability. Gives Kirby the Cutter ability. Gives Kirby the Jet ability. Gives Kirby the Spark ability. Gives Kirby the Mike ability. Gives Kirby the ESP ability. Gives Kirby the Wheel ability. Gives Kirby the Circus ability. Gives Kirby the Archer ability. Gives Kirby the Leaf ability. Gives Kirby the Beam ability. Randomly gives Kirby the Fighter, Sword, or Spark ability. Provides a random copy ability to Kirby. Kirby's Blowout Blast Unlocks a decoration based on the scanned character and changes the background music. Kirby's Extra Epic Yarn Gives Kirby the Knitting Needle Ravel Ability with a unique hat. Gives Kirby the Wire Ravel Ability with a unique hat. Gives Kirby the Button Ravel Ability with a unique hat. Kirby Star Allies Gives Kirby, King Dedede, Meta Knight, and his allies items and food. Little Nightmares: Complete Edition Gives the player an exclusive Pakku Mask for the character to wear. Luigi's Mansion (Nintendo 3DS) Makes Super Mushrooms appear instead of Poison Mushrooms from enemies and such for health. Fully revives the player when completely running out of health. Also assists in finding Speedy Spirits. Mario & Luigi: Bowser's Inside Story + Bowser Jr.'s Journey Gives Mario, Luigi, and Bowser an item to use in their adventure. Mario & Luigi: Paper Jam Allows the player to change ? Battle Cards they have found into character cards for use in battle. Mario & Luigi: Superstar Saga + Bowser's Minions Allows the player to collect stamps in exchange for gear and beans. Mario & Sonic at the Rio 2016 Olympic Games (Wii U) Allows the player to compete in the Mario league tournament. Winning this tournament unlocks a Gold Mario Mii costume. Allows the player to compete in the Sonic league tournament. Winning this tournament unlocks a Super Sonic Mii costume. Gives the player Coins or Rings that can be used at the item stand. Mario + Rabbids Kingdom Battle Gives the player two new weapons: one for the character the amiibo is based on, and one for the character's Rabbid counterpart. Each amiibo can only be used once. Mario Kart 8 Deluxe Permanently unlocks racing suits for the player's Mii themed after the scanned characters. The Splatoon-themed outfit, as well as compatibility with all Animal Crossing amiibo, are exclusive to Mario Kart 8 Deluxe. Mario Party 10 Compatible with amiibo Party mode. Unlocks personal board of scanned characters. Allows the player to play Scratch Bonus and win Mario Party points. Mario Party: Star Rush Various effects by mode, generally summoning the scanned character to assist the player. Mario Party: The Top 100 Various effects by mode. Mario Tennis: Ultra Smash Allows the player to use the scanned character as a tennis partner that can be trained and improved. Mega Man 11 Grants the player an Energy Tank and other useful in-game items. Switch version only. Mega Man Legacy Collection Unlocks 10 additional challenge stages designed as part of a fan contest. 3DS and Switch versions only. Mega Man Legacy Collection 2 Unlocks additional challenge stages. Switch version only. Metroid Prime: Federation Force Recolors the player's mech based on the scanned amiibo. Unlocks a skull-themed recolor for the player's mech. Metroid: Samus Returns Unlocks a missile reserve tank that will restore some of Samus's missiles upon running out. Unlocks a concept art gallery after completing the game. Unlocks an energy reserve tank that will restore some of Samus's health upon running out. Unlocks a sound test after completing the game. Miitopia Unlocks character-based costumes for the player's Miis. Mini Mario & Friends: amiibo Challenge Creates a toy character of the scanned character to navigate a level; different character toys have different abilities. Creates a Mini Spec to navigate a level. One Piece: Super Grand Battle! X Unlocks matching costumes for various playable characters; see here for more details. Picross 3D: Round 2 Unlocks a Picross puzzle based on the scanned character. Pokkén Tournament DX Unlock various in-game items such as clothing items and money. Up to five can be scanned daily. Resident Evil Revelations 2 Grants the player a high amount of BP Points for the Raid Mode shop or better resources for use in Raid Mode games. Can be scanned once per day. Grants the player a random amount of BP Points for the Raid Mode shop or resources for use in Raid Mode games. Each amiibo can be scanned once per day. Splatoon Unlocks 20 Charger challenges in Octo Valley and rewards the player with an exclusive costume piece for every four challenges completed. It only recognizes the Inkling's amiibo as the Inkling Girl In-game. Splatoon 2 Saves the player's current loadout to the scanned amiibo and spawns the character depicted on the amiibo, which gives the player exclusive gear and the option for the player to take a picture of their avatar and the amiibo character in certain locations. Star Fox Guard Calls in an Arwing air strike to wipe out all enemies. Limit of one use daily. Star Fox Zero Unlocks a SNES-style Arwing, which cannot lock onto targets. Unlocks the Black Arwing, which can lock onto two targets at once but takes triple damage. Style Savvy: Fashion Forward Gives the player themed articles of clothing based on the scanned character. Style Savvy: Styling Star Gives the player themed clothing patterns based on the scanned character. Gives the player randomly themed clothing patterns. Super Mario Maker Gives Costume Mario the appearance of the scanned character, in 8-bit form. These costumes can also be unlocked through the 100 Mario Challenge. Super Mario Odyssey Gives the player the Classic Cap and Classic Suit and grants temporary invincibility. Gives the player the Luigi Cap and Luigi Suit. Grants the player a Life-Up Heart. Gives the player the location of some Regional Coins in the kingdom the player is in. Gives the player the Doctor Headwear and Doctor Outfit and grants temporary invincibility. Gives the player the Diddy Kong Hat and Diddy Kong Outfit. Gives the player the Wario Cap and Wario Suit. When talking to Uncle amiibo, reveals the location of a Power Moon on the current kingdom map. Any other time, it rewards the player with a set amount of coins or hearts. Super Mario Party Unlocks stickers for the player to display on the sticker board. Grants Party Points that the player can spend on background music and other extras. Taiko no Tatsujin: Atsumete Tomodachi Daisakusen! Unlocks songs from the character's game of origin. Team Kirby Clash Deluxe Grants elemental shards. Teddy Together Gives the player bonus coins. The Elder Scrolls V: Skyrim (Nintendo Switch) Gives the player a 20% chance to unlock either the Master Sword, Heroes Clothes, or the Hylian Shield. Also obtainable through normal gameplay. Gives the player food, gold, gems, weapons or armour. Also applies to the Legend of Zelda amiibo. The Legend of Zelda: Breath of the Wild Spawns Epona, a recurring horse from the series. Can also spawn the Twilight clothing set. Spawns plant-based items and a treasure chest containing a valuable item. Can also spawn the Twilight Bow, a bow used by Zelda to fire Light Arrows in The Legend of Zelda: Twilight Princess. Spawns mushrooms and a treasure chest containing a weapon. Can also spawn Sheik's Mask, a Sheikah head armor. Spawns barrels containing rupees and a treasure chest containing a valuable item. Can also spawn the Sword of the Six Sages, wielded by Ganondorf in The Legend of Zelda: Twilight Princess. Spawns fish and a treasure chest containing arrows. The Wind clothing set and Sea-Breeze Boomerang can also be obtained. Spawns fish and a treasure chest containing a valuable item. Spawns an assortment of food based items. The Legend of Zelda: Twilight Princess HD Fully replenishes Link's arrows. Receive twice as much damage from enemies. WarioWare Gold Wario draws an incredibly detailed sketch of the scanned Wario amiibo that can be sold for gold coins. Wario draws a crude sketch of the scanned amiibo that can be sold for gold coins. Wario draws a random sketch that can be sold for gold coins. Up to three can be scanned per day. Also applies to the character amiibos. Word Puzzles by Powgi Creates a word puzzle based on either the amiibo's nickname or owner's name. Xenoblade Chronicles 3D Awards 3 tokens per day that can be used to unlock music and character models. Yoshi's Crafted World Gives the player a cardboard costume with a design based on the amiibo. Gives the player a random cardboard costume. Poochy & Yoshi's Woolly World Activates Double Yoshi mode and unlocks a "plastic" Yoshi design. In both versions: gives the player a Yarn Yoshi with a design based on the amiibo that was used. The two designs of R.O.B. 's amiibo unlock distinct costumes from one another. Wii U version: Gives the player a Yarn Yoshi with a generic design of the amiibo logo. 3DS version: gives the player a Yarn Yoshi with a design based on the amiibo that was used. In both versions: gives the player a Yarn Yoshi with a generic design of the amiibo logo. Other series of amiibo compatible with Super Smash Bros. The following amiibo from other release sets are compatible with both Super Smash Bros. 4 and Ultimate. All color, size, and style variations from these sets will function identically in Smash. *In Ultimate, their wedding variants also rewards spirits, with the case of Wedding Mario, which rewards his fighter spirit. *Functions as Link in Super Smash Bros. 4. Additionally, the following non-fighter amiibo figures will reward the player with a spirit when scanned in Ultimate. If the spirit is a Master Spirit, their function will be unlocked as well. How to work amiibo figures with the Wii U. Promotional art depicting Mario and Link's amiibo in SSB4. Large-scale model of Mario's amiibo at Nintendo New York in February 2016. Official amiibo display diorama based on Battlefield. Originally at launch, Shulk's amiibo was exclusive to GameStop in North America, the same store his game, Xenoblade Chronicles, was exclusive to in its North American release. The font itself is the Bauhaus 93 font, which is also used in many of the games in the Super Mario Bros. series. The R.O.B., Cloud, Corrin, and Bayonetta amiibo are currently the only amiibo to have different versions in the Smash line. The R.O.B. amiibo is the only amiibo with multiple versions featuring the same pose. The Cloud and Bayonetta amiibo are the only amiibo with multiple versions featuring different costumes. The Corrin amiibo is the only amiibo to have male and female versions. Mr. Game & Watch's amiibo comes with multiple unique poses that can replace the original pose. One is based on his official SSB4 artwork, as are other amiibo; others feature his parachute from Fire, getting a 9 using Judge, and a bell-ringing pose resembling his side taunt and artwork pose from Super Smash Bros. Melee and Super Smash Bros. Brawl. Amongst his four poses, the pose depicting his number 9 Judge is the only pose that was never used as an in-game trophy pose for any game in the series. Mewtwo's amiibo released in Europe on October 23rd, 2015, one year to the day after it was confirmed to be a downloadable character during the Super Smash Bros. for Wii U: 50-Fact Extravaganza. Since Pokémon Rumble U can use anything with NFC technology to briefly summon a random helper Pokémon, it incidentally supports all amiibo. If the player feeds an amiibo equipment, and then exits the amiibo menus without saving the changes to the amiibo, that equipment will disappear anyway. The only way to get it back is to quit the game without letting the game save. Isabelle, Inkling, Daisy, Chrom and Young Link are the only playable characters with amiibo released before their respective Super Smash Bros. series amiibo; as such, they have amiibo usable in Super Smash Bros. Ultimate that predate the release of their actual Smash amiibo. Mega Man is the only third party fighter to have an amiibo outside the Super Smash Bros. series. Pikachu's Detective Pikachu amiibo is not compatible with Smash 4, and as such is the only amiibo figure to depict a Smash character to not have any functionality in Smash. However, Detective Pikachu is a spirit in Super Smash Bros. Ultimate, and the Detective Pikachu amiibo does grant this spirit in-game. amiibo cards are also not compatible with Smash 4, so while Mewtwo, Donkey Kong, Diddy Kong, Yoshi, and all Mario series characters except Dr. Mario have cards, they will not work. If Charizard's amiibo is scanned in Ultimate, it will count as the Pokémon Trainer, but the default Pokémon will be Charizard. amiibo that show characters in an alternate costume will have their Figure Player default to that costume. This includes the "Player 2" versions of Smash Bros amiibo, but also amiibo from other lines such as Inkling Boy, Isabelle in her winter jacket, and Mario in his wedding outfit. Ike's amiibo, despite representing his default costume in Super Smash Bros. 4, defaults to his alternate costume in Ultimate; as such, there is no Ike amiibo that defaults to his default costume. Link, Samus and Peach do not have amiibo based on their Ultimate renders, but have non-Smash amiibo based on the renders used for their Fighter Spirits. Link is the only character who does not have a Smash amiibo based on his Ultimate design, but who has a non-Smash amiibo (from the The Legend of Zelda: Breath of the Wild line) that represents the design and incarnation used for him in Ultimate. Due to their relative lack of design changes from SSB4 to Ultimate, Samus and Peach have amiibo that can be said to represent both their Ultimate in-game designs (albeit in different poses) and their Fighter Spirits. Timmy and Tommy is the only master spirit which can be obtained via amiibo. Some Ultimate-era reprints of SSB4 amiibo, such as Samus, Bowser and Mewtwo, have more saturated colors to possibly better match their Ultimate designs. ↑ JP amiibo compatibility chart (Super Smash Bros. Ultimate). amiibo that are fighters have a "Read/Write" function, amiibo that are non-fighters have a "Read Only" function.